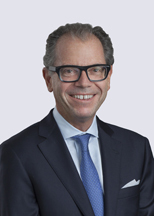 David Foltyn has served as the Chairman of the Board and Chief Executive Officer of Honigman since 2008. Under his guidance, the firm has instituted innovative strategies to become a value leader in the legal marketplace by implementing processes, technology, and staffing models to increase value and maintain the high quality of its legal services. In addition, David has enhanced the recruitment and development functions of the firm by providing a wide variety of internal and external tools to assist attorneys and staff with career advancement. He is also a community leader and serves on boards such as the Downtown Detroit Partnership, the Detroit Regional Chamber of Commerce, and the United Way for Southeastern Michigan, among others. David successfully led the firm through the acquisition of a Chicago-based litigation boutique and the integration of its lawyers into Honigman. Already Michigan’s largest law firm, Honigman now has more than 300 legal professionals in the Midwest and a growing national client base served by prominent practices in intellectual property, private equity, corporate and securities, real estate, and litigation, among others. Before becoming Chairman and CEO, David served the firm as Recruiting and Business Development Partner and Co-chair of the Strategic Planning Committee. 2018 "David Foltyn is an experienced adviser acting on a broad range of corporate matters, including mergers, acquisitions and related financial transactions. He enjoys a strong reputation as a 'fantastic M&A lawyer.'" 2017 – "[David] is held in high regard for his longstanding reputation in the market. He is well placed to represent clients in mergers, acquisitions, public offerings and a wide range of financial transactions. Sources describe him as 'a very talented lawyer' who has 'built a great practice.'" 2016 – "David Foltyn regularly handles sales, purchases and public offerings for a diverse list of corporate clients. Reporters find that he is 'very practical, smart and knows how to work as part of a team.'" 2015 – "David Foltyn advises on M&A, public offerings and securities, and is singled out by market sources as a 'wise and trusted adviser.'" 2014 – "[David] 'has the ear of his clients, offers practical solutions and doesn’t mess around,' according to commentators. He provides guidance on subjects such as corporate governance, divestitures and public offerings." 2013 – "The 'terrific' David Foltyn is chief executive of the firm. He has extensive experience in a range of corporate matters, including M&A, public offerings and private equity transactions." 2012 – "Firm chief executive David Foltyn is viewed as a 'very impressive' corporate M&A lawyer with extensive experience in handling transactions for venture capital firms and other financial institutions."